Up/Down to go | Left/Right for tiltys | 1-5 for tricks Spacebar to pause. Unlock new cars, upgrade, and try to get all the achievements! Race around various tracks across the USA in classic V8s. 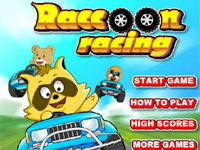 Compete with other raccoons as you race your kart or hovercraft through 8 different tracks. Nice and funny car racing game.